I would be lost without these two. Lacey (Jack Russell) came into my life when she was only 7 weeks old. I was always a cat person until I looked into the eyes of this little puppy. Her living conditions were terrible and I knew I had to do something to save her and her siblings. Lacey will be 2 in February and she has completely changed my life for the better. 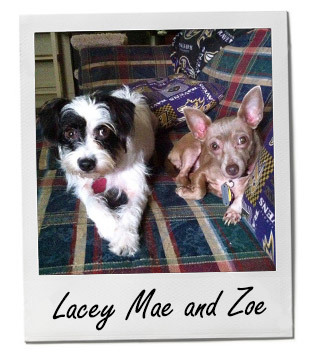 Zoe (Chihuahua) was pulled from a high-kill shelter her owner surrendered her to – I don't know the complete details but I heard they wanted her put down. She was brought up from NC and I saw the rescue that had posted a picture of her on Facebook. Right then and there I knew I had to have her. It will be a year in March that she has been part of my family. These two complete me. They are not just pets, they are my family. My life is complete with them. It's funny how animals come into our lives and make things better.